The North Bend Rail Trail is a 72-mile multi-purpose recreation trail, designed for mountain biking, hiking and horseback riding. However, bird watchers find the trail exciting and helpful in their hobby. There are 13 tunnels along the Rail Trail, 10 of which the trail passes through. Three tunnels were abandoned by the Railroad but may still be viewed along the trail. The Rail Trail also crosses 38 bridges. The Number 13 tunnel, pictured above, is 353 feet in length and crosses Bonds Creek. The 337-foot long Number 10 tunnel, West of Ellenboro is a "raw" or natural tunnel bored through solid rock; and far more fanciful, the Silver Run Tunnel, Number 19, is said to manifest the image of a young woman in white as recounted in the story the "The Silver Run Tunnel." 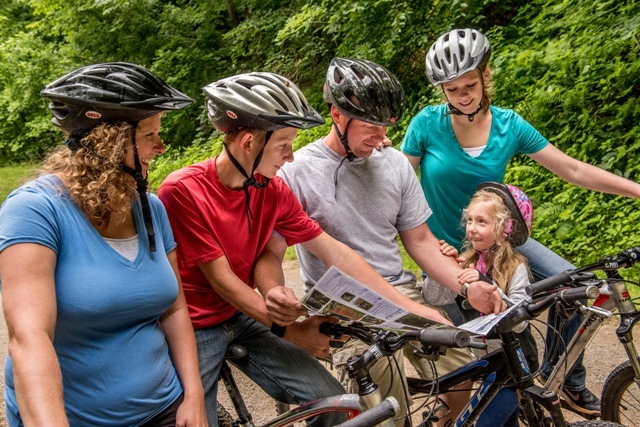 Great pieces of history, architecture, scenery and recreational opportunities, North Bend Rail Trail is a great place to bike, cross country ski, horseback ride or walk. During the tumultuous years between 1853 and 1857, prior to the Civil War and the creation of the State of West Virginia, the Baltimore and Ohio Railroad constructed this section of the rail corridor, that, due to the terrain, required numerous bridges and tunnels. Motorized vehicles are not permitted on the trail, except motorized wheelchairs for the handicapped. With only a three percent grade, the Rail Trail is ideal for all skill levels. The Rail Trail extends from Parkersburg, WV, at the western terminus to Wolf Summit, near Clarkesburg, WV, along the abandoned B & O Railroad corridor. With only a three percent grade, the Rail Trail is ideal for all skill levels. It has a crushed limestone surface although some areas are blacktopped in some towns. There are three original B&O Railroad depots along the trail. They are located in Salem, Smithton, and Pennsboro. The depot in Pennsboro is open on some weekends in the summer months and by appointment. The Smithton depot is open by appointment. The Salem depot is closed due to damage sustained during a fire. To report hazards such as downed trees, aggressive dogs or other problems, please call North Bend State Park at 304-643-2931. In an real emergency, please call 911. North Bend Rails to Trails Foundation, Inc. The North Bend Rails to Trails Foundation, Inc., is a non-profit organization, represented by citizens of the four counties (Wood, Ritchie, Doddridge and Harrison) which make up the North Bend Rail Trail. They support, promote and provide for the improvement of the Rail Trail. The Foundation may be contacted at: North Bend Rails to Trails Foundation, Inc., P.O. Box 206, Cairo, WV 26337, 304.628.3777, info@northbendrailtrail.org or by clicking on the link above.